This old English cottage plant is making a comeback, and no wonder. 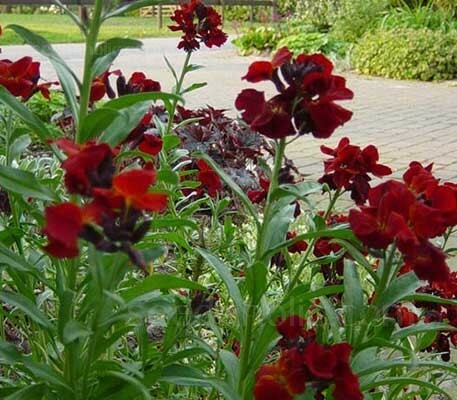 Wallflower 'Blood Red' Also known as 'Covent Garden', with its astonishing, deep crimson, velvety red flowers is a favourite with gardeners. They are sure to be a focal point and are especially valuable because they bloom in the period between primroses and summer annuals and a perfect foil for daffodils and many other spring bulbs. With a delicate fragrance that is most pronounced on a sunny day, they will supply the household with an abundance of cut flowers for many weeks. Ideal for borders and edging, they could also be used in large containers….and of course, walls! Extremely easy to grow and very rewarding, no flower is more delightful in early spring. Erysimum cheiri, (formerly Cheiranthus cheiri), commonly known as Wallflowers which along with similarly fragrant Stocks, are called giroflées in French (literally, "clove-scented"), are widely grown as winter bedding plants and are found self-sown through many cottage gardens and their walls. That's where they get their English name of wallflower: they love the sharp drainage of a little pocket of gritty soil in a stone wall. That's a hint on how to grow wallflowers: give them excellent drainage, especially if you have clay soil. Mix some coarse sand and compost into the planting area. And give them full sun; wallflowers aren't meant for shade. Cheiranthus prefer temperatures of 21°C (70°F) days and 10°C (50°F) nights and can flower in moderate heat at a maximum temperature of 27°C (80°F). Plants require 70 to 80 days to flower from sowing and will start flowering when they are 10cm (4in) tall. Start in pots or sow direct in mid August. Surface sow in pots or containers containing good quality seed compost (John Innes or similar) Cover with a fine thin layer of compost or vermiculite. The compost should be kept moist but not wet at all times. Seed germinate in seven to 10 days at 20°C (68°F). Prick out each seedling as it becomes large enough to handle, transplant into 7.5cm (3in) pots. Gradually acclimatise to outdoor conditions for 10-15 days before planting out after all risk of frost. Seeds may also be sown outdoors directly where they are to flower or in a reserve bed in a sheltered position. Prick out to 15cm (6in) apart and transplant in October. Deadheading wallflowers prolongs their bloom, but let some of them go to seed. They are often generous self-sowers, or you can gather the seed and resow it yourself. Wallflowers look great interplanted with tulips, especially the lily-flowered types whose elegant forms contrast nicely with the mounded flower heads of the wallflowers. There are basically two types of wall flower, ‘Siberian’ and ‘English’. Wallflowers have a long history. The heavily scented biennial flower was commonly carried as a nosegay to smother the stench of Elizabethan streets. And the name cheiranthus is thought to derive from the Greek for hand (cheir) and flower (anthos), indicating their use as a floral version of the pomander. John Gerard, writing in 1596, said that "the wallflower groweth on bricke and stone walls, in the corners of churches, as also among rubbish and other such stony places everywhere", alluding to how the plant got its common name, as well as its love of good drainage and sun. Many varieties have been around for at least a century and some bear the prefix Bedder, an indication of their wide use in Victorian planting schemes.